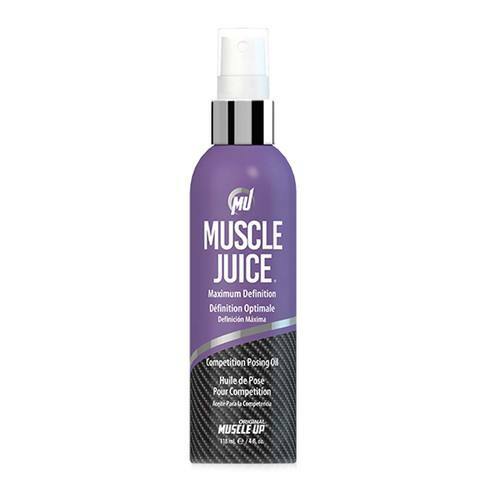 Pro Tan Muscle Juice Posing Oil is designed to stand up to the harsh critique of stage lights. Warnings: For external use only. Avoid contact with eyes. In the event of contact with eyes, rinse immediately with water. Discontinue use if skin irritation occurs. Keep out of reach of children. Notes: Natural oils. Tropical Mango Lime scent. Ingredients: Glycine Soja (Soybean) Oil, Zea Mays (Corn) Oil, Petrolatum, Paraffinum Liquidum, Parfum (Fragrance), Lanolin, Tocopheryl Acetate, Limonene, Geraniol, Linalool, Hydroxyisohexyl 3-Cyclohexene Carboxaldehyde. Recommended Use: Spray directly over entire body. Massage into skin. Be careful as to not get any on posing suit and/or bikini. Reapply for added sheen.